Many models of the Beech 18 were produced over the years and because of its versatility and adaptability they were used in numerous configurations by both civilian and military operators, worldwide. The "Twin Beech" served alongside the DC-3 as the backbone of the corporate fleet and the air freight industry during the 1950-60's. For decades, neither snow, nor rain, nor heat, nor gloom of night kept these courageous couriers and their pilots from the swift completion of their appointed rounds as mail carriers. Tell me one other airplane that has been so radically modified for so many different needs, and has still done well! They have almost been like pretzel dough in the hands of entrepreneurial engineers. My intention is to show Twin Beechs of the past and the present. Some will make you laugh, others will make you sad. Relatively few remain in airworthy condition and even fewer are active, working airplanes. My greatest lack is photos of low-cabin civilian and converted military aircraft in their glory days as corporate aircraft. 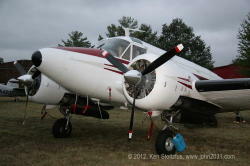 I highly recommend Bob Parmerter's coffee table book, BEECH 18, and refer to it often. It is "the book" on Twin Beechs, and unless you have a generous twin named Karl who gives you one, you can buy it at _____?????__________. 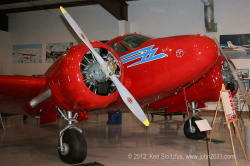 I have divided the Twin Beech photos into these categories. Many photos are my own, others are from slides or prints in my collection, as indicated. All purchased slides and prints in my collection are for sale. Old Props, a partial register of Twin Beechs around the world. Lots of photos! Other airplanes too. Joe Baugher search page. Upper and lower case are critical.